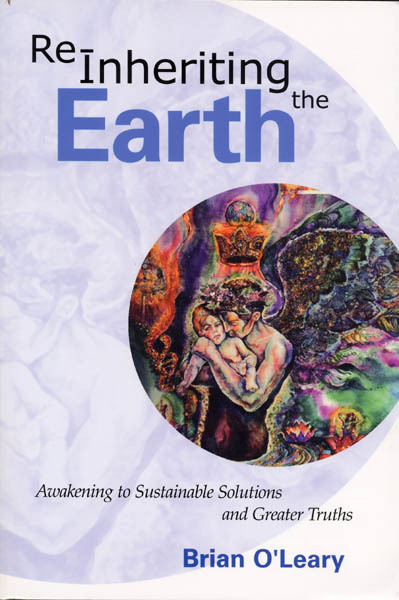 This breakthrough book by a noted visionary scientist-author reveals the corruptions of and solutions for a global culture deeply troubled by pollution, greed and suppression. Many approaches are examined: scientific, ecological, philosophical, political, social, spiritual and personal. Included are the latest developments in new energy, oil politics, what underlies the California and global energy crunch, and what choices we have for solving the crisis. Much more, this book is a blueprint for what we must do. I Re-Inheriting the Earth is a call to action for general readers worldwide. It is for concerned global citizens open to solutions and wary of the collusion between large industries and Western governments. In America, the readership would include most Democrats, disillusioned Republicans, and those who didn't vote at all in 2000 (that's most of us). It includes those fed up with the conventional wisdom of the media, universities and corporations. This book provides answers we will need to implement in the near future. Included are a wide variety of clean, renewable and cost effective energy options, and ways of reversing our abusive global industrial, forestry, agricultural and water use practices, through a mix of traditional and innovative approaches. In the second part, we address the most challenging problem of all: first understanding the nature of our tyranny, and second, looking at ways in which we can change socially and personally to meet the challenge. Dr. O'Leary shares his regret that his native America leads the way in global pollution, but he also points out that the U.S. is a land of innovation and answers. Towards the end of the book, O'Leary suggests "we are in a global spiritual crisis which demands that we remove our veils of denial and enter a new science of consciousness, exploring our potential to heal, our eternal nature, and our membership in a cosmic community of beings." We must not only create an ecologically sustainable future, he says, but we need to lift ourselves out of poverty, war, meaningless work and the ignorance of new knowledge. He concludes that we need to form a global green democracy which would oversee our sustainable, peaceful and mind-expanding futures. Adopt a Manifesto for Sustainability: A Declaration of Interdependence. Re-Inheriting the Earth: The Narrowing of the Energy Policy Debate and How We Must Transcend it. What a difference a few months make! When I was writing Re-Inheriting the Earth late last year, people seemed oblivious about our energy problems and now it's in the headlines every day. Yet the press omits any mention of the inevitable demise of the fossil fuel age, which will become necessary because of dwindling supplies and increasing pollution. In the long run, the issue will be joined between two opposing forces. The one now in power will certainly lead our culture into a state of such disarray, there may be no way out. The other offers sustainable solutions. The Bush administration has wasted no time offending the rest of the world with its insistence on nullifying the Kyoto agreement on global warming emissions, drilling in the Arctic National Wildlife Refuge, forestalling renewable and clean energy research, building new fossil fuel power plants which would contribute even more to America's lead in carbon emissions, protecting the interests of the rich and big business, and promoting a costly and destabilizing missile defense system. Unfortunately, in the eyes of the mass media, discussion about ending pollution and global climate change has been abandoned. The debate has narrowed to political and short-term economic considerations rather than the long-term physical facts and technological directions which would surely prompt a serious discussion of a sustainable future, as described in my new book. Innovation and even talk of innovation are stifled at almost every turn. A recent example is a USA Today cover article "Six Ways to Combat Global Warming" (July 16, 2001 issue). No mention is made at all about the real solutions such as solar, wind, hydrogen, improving efficiency and new energy research. Instead, we only heard about political steps like ratifying the Kyoto agreements (too little too late, but a still an important step towards international cooperation) to nonsteps such as trading emissions credits for the privilege to pollute, doing more studies, or doing nothing at all. How could these be considered ways to combat global warming? Is this neglect of considering the clean, renewable options a reflection of the dumbing-down of America, is it greed, is it fear of the loss of power? Or has the energy cartel joined ideological forces with the media and government to buttress the status quo at any cost? In my more than forty-year history as a senior energy analyst, I have never seen a debate narrow to such nonsolutions which appear as propoganda. Since my childhood, I learned how the USA was a land of invention and opportunity, not an energy-hungry empire which suppresses solutions and is an embarrassment to the rest of the world. This can be very disquieting on the home front and invite ever more denial of our responsibility. The only global option we have is to cut our toxic emissions to near-zero--a measure which not only prevents global suicide but is cost-effective in the long run. Over the coming decades, petroleum and natural gas will become more scarce and expensive, and certainly not cost-competetive with clean renewables. The only beneficiaries will be the giant energy companies, related infrastructure and the very wealthy. The rest of us will suffer from more toxic pollution of the air, global climate change, escalating prices and more dependence on foreign oil. We can end our addiction to fossil fuels by first acknowledging that they have dominated our international economy and that now we must find ways to replace them through innovation and active civil participation. Once this becomes more widely understood, coal, oil and natural gas will go the way of tobacco, but on a much larger scale and a greater toll of lives. I hope my new book will help you understand the depth of the situation and inspire solutions. We must expand the debate to embrace the real answers. Fortunately, those answers do exist and need to be presented to the public. Our silence in this matter suggests a more insidious aspect of control in the exercise of power. "The most successful tyranny is not the one that uses force to assure uniformity but the one that removes the awareness of other possibilities", said Allan Bloom in The Closing of the American Mind. Noam Chomsky stated the problem this way: "The smart way to keep people passive and obedient is to strictly limit the spectrum of acceptable opinion, but allow very lively debate within that spectrum - even encourage the more critical and dissident views. That gives people the sense there's free thinking going on, while all the time the presuppositions of the system are being reinforced by the limits put on the range of debate." So what can we do? Re-Inheriting the Earth proposes the establishment of a global green democracy which would have jurisdiction over unbridled competition and growth of giant multinational corporations and their friends in politically high places. These forces of globalization and "free trade" encourage the very powerful to step into those countries that have the cheapest labor and most relaxed environmental standards in a vicious cycle of pollution and competitive stress. These unregulated actions make a mockery of authentic free trade which could deliver the needed goods and services for a green future. I present in my book the case for the most urgent measures, ones upon which the preponderant number of citizens of the world would agree. 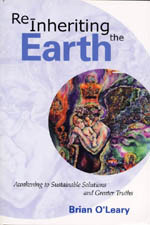 Included would be the shift of public subsidies from polluting to clean enterprises, enforcing strict emissions standards, controlling the excesses of economic globalization, protecting workers, ending nuclear technologies and other weapons of mass destruction, and taxing international currency speculation for the relief of Third World debt and for the creation of new enterprises which would protect, restore and sustain the biosophere. In order to do this job as quickly as possible, I have become aware of a brilliant idea proposed by John Bunzl in England. It is called the Simultaneous Policy (www.simpol.org ). Under this plan, measures such as those listed in the previous paragraph would be adopted in principle by any individual, organization, city, state or nation that wishes to do it. (I am already on board as an adopter.) Meanwhile, business-as-usual would continue to prevail, so adoption would pose no immediate threat to existing policies. By the sheer force of attraction, the Simultaneous Policy would then be adopted by more and more nations, until every country has done so. At that moment, the new measures would be implemented simultaneously by each nation to enact the needed paradigm shift. Ideally, this would be the first step for global green democracy in action, without needing yet to establish the new governance structures themselves, which might take a longer time than we have to reverse the accelerating deterioration of life on the planet, as chronicled in my book. This innovative solution could also allow us plenty of time to debate appropriate measures upon which a majority of people in the world would eventually agree. The idea could be likened to responding to the outbreak of a serious fire. Whereas pouring buckets of tap water on the fire would never do the job (our current situation of legislating incremental solutions), calling the fire department and waiting for their special equipment to arrive would be what the Simultaneous Policy could do: It would give us the chance to put out the fire once and for all, but at a later time. Our global civic responsibility is to call the firemen to come out quickly, at which time decisive action can reverse the damage. We have been asleep at the wheel of democracy while the fire rages on. It is time to awaken to sustainable solutions and have the courage to embrace them. The process of ratifying the Kyoto agreements on carbon dioxide emissions provides a good example of what could be done with the Simultaneous Policy. It therefore would not be surprising if the United States were to be the last holdout to adopt the policy, but could you imagine the moral pressure which would be mounted against the American Government for not adopting it? There is a deeper spiritual crisis lurking: current power structures are effectively blocking the need to transform our ethics from ruthless competition to cooperation, from selfishness to selflessness, from separation to unity, from greed to generousness, from staying inside a box of the false security of bread-and-circuses to embracing greater truths of our being. President Abraham Lincoln said: "Nearly all men can stand adversity, but if you want to test a man's character, give him power." Power is vested in the wrong places now, and the necessary shift will need to be returned to the people by a global consensus which has no precedent. The design of a new world governance structure will be one of our greatest challenges and opportunities in human history. The quest for new knowledge of our being is also a birthright which has been diverted to a mass culture that has arbitrarily separated church and state, has confused dogmatic religion with individual spritual transfomation, and has overlooked the enormous potential of a new science of consciousness. I have noticed that many leaders of the sustainability movement have not gone much further than our political, business and religious leaders have in understanding this point, and so are sometimes missing the full range of solutions and spiritual openings - sometimes called miracles. I'm sure some environmentalists will take issue with my attempts to bridge the gap between sustainability and greater truth. Yet my discussion is well-grounded in collective human experience and scientific study. These paradigm-breaking topics have been omitted in the debate by the same dynamics as the quest for clean energy. "In the councils of Government, we must guard against the acquisition of unwarranted influence, whether sought or unsought, by the Military-Industrial Complex. The potential for the disastrous rise of misplaced power exists, and will persist. We must never let the weight of this combination endanger our liberties or democratic processes. We should take nothing for granted. Only an alert and knowledgeable citizenry can compel the proper meshing of the huge industrial and military machinery of defense with our peaceful methods and goals so that security and liberty may prosper together." With this statement, corroborated by reputable witnesses, the two topics of sustainability and greater truth become joined. Perhaps we can begin to understand that the genesis of the dominance of fossil fuels and nuclear energy and the suppression of options has been a secret policy of economic and political/military forces whose power Eisenhower felt so compelled to expose. Perhaps we are seeing the advanced phases of a massive conspiracy to profit and pollute by keeping the rest of us ignorant about real solutions. Whether we look at the consolidation of economic power or clandestine political power as the principal cause of our demise, democracy will need a big boost. The next phase of the Disclosure Project would be to have open Congressional hearings. Perhaps a significant part of the robust secrecy apparatus has been to suppress "free energy". This is a concept which spans the gap between the sustainability movement (who deny these possibilities) and the need to embrace greater truth. The possibility of free energy is imminent, with hundreds of reputable reports of "over-unity" power coming in from laboratories all over the world. I myself have seen many such demonstrations. Free (or new) energy would cause one of the most extraordinary revolutions in the history of technology (examples include special electromagnetic devices, cold fusion, and hydrogen gas cells). It needs to be debated widely and openly about its great benefits as well as its potential for abuse in the wrong hands. Attempts to bring free energy into the world have been thwarted at every turn, because this would spell the end of the energy cartel. As scientist-inventor Dr. Tom Bearden put it, "The cost of a single large power plant will solve the entire world energy crisis forever." But for understanding free energy and UFO/ET disclosure, many more of us will need to have the courage to awaken to these greater truths, even if they appear bizarre at first blush. Unfortunately our culture has fragmented itself into so many factions that do not communicate with one another, our expanded knowledge and awareness are artificially kept away from us. There are too many vested interests among scientists, industrialists and governmental officials to acknowledge free energy. Yet it exists. I believe that the awakening will require that we move even beyond the sensible democratic policies of achieving sustainability and curbing the power of multinationals and governments who continue to profit while devastating the planet: We will need to examine who we are, why we're here , what happens after our lives on Earth, and how our consciousness can heal ourselves and the world around us. The clues to answering those questions are everywhere, if only we dare to look. I know these are radical ideas, and some of you might think them to be irrelevant speculation. That is o.k. with me. From my experience and study over three decades, I have learned that going outside the box of materialistic western science to the realms of consciousness will make our paradigm shift so much easier. But in the short term, allopathic remedies such as solar, wind, hydrogen and new energy will be absolutely necessary because the Earth is in the emergency room. We need to lend all the assistance we can.